One of the few surviving Jedi after the execution of Order 66, Kanan Jarrus went into hiding to escape the Emperor’s purge. He once again embraced his identity as a Jedi Knight, and became a leader among a small but determined band of rebel freedom fighters. He carries a lightsaber and a blaster – an uncommon practice for Jedi. Experience the journey of the Ghost Crew, the young and fearless Rebel Resistance group from Star Wars Rebels! 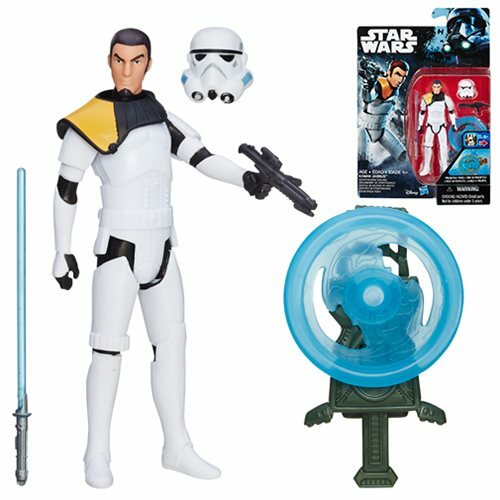 Relive the daring action and excitement from the Star Wars universe with this 3.75-inch Kanan Jarrus (Stormtrooper Disguise) figure from Star Wars Rebels, and collect and do battle with these and other figures and vehicles from Hasbro Star Wars! 3 3/4-inch scale action figure includes helmet, lightsaber, and launching weapon.